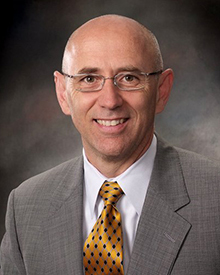 Life University (LIFE) announces that Gilles LaMarche, B.S., D.C., has been named the University’s Vice President of University Advancement. In a process that took several months, Dr. LaMarche was ultimately chosen for the position and made a smooth transition from his previous University position as Vice President of Professional Relations – which he had held since 2013. From Timmins, Ontario, Canada, Dr. LaMarche is an accomplished author, professional speaker and certified personal development/executive coach. He found his calling when at the age of 12 he was taken to a chiropractor after years spent as an “unwell” child. His only expectation was that a chiropractor might help him resume regular activities without pain, but little did he know that the course of his life would change when he discovered the science, art and philosophy of Chiropractic, thus leading him to a vision for better health. His vision, which he continues to this day, is to help the world discover the importance and value of taking personal responsibility for overall health and well-being naturally. Life University offers 15 undergraduate degrees, including a pre-chiropractic track; four graduate programs, which encompass areas of sport health science, clinical nutrition, positive psychology and athletic training; and the world’s largest single campus Doctor of Chiropractic program. Explore all of LIFE’s degree offerings at www.LIFE.edu. Founded in Marietta, Georgia in 1974, Life University is a health sciences institution most known for its chiropractic program, the largest single campus chiropractic program in the world. Life University is regionally accredited by the Southern Association of Colleges and Schools Commission on Colleges (SACSCOC) to award baccalaureate, master’s, and Doctor of Chiropractic degrees, and also has programmatic accreditation through the Council on Chiropractic Education (CCE), the Accreditation Council for Education in Nutrition and Dietetics (ACEND) and the Commission on Accreditation of Athletic Training Education (CAATE). The mission of Life University is to empower students with the education, skills and values necessary for career success and life fulfillment, based on a vitalistic philosophy.